Several years ago, Google offered a real estate search site. Powered by the now defunct GoogleBase, brokerages imported their data manually or via an app which fed the search site. GoogleBase also provided data for user generated real estate maps. But that was before February 2011. In their sayonara post, Google pointed to low usage but also suggested that the search and map models may not be the best way for users to find real estate. The Atlantic Monthly questioned the low usage excuse pointing out how the real estate search seemed purposely hard to find. The author also wondered what those better ways for users might be. His best guess was that Google didn’t like relying on brokerage submitted data, which, they realized, was often out of date. Fast forward to now – as in Google Now. A virtual assistant of sorts, it provides you with the “right information at the right time.” As it applies to real estate, Google Now integrates with several domestic and international residential listing sites including Zillow, Trulia and Redfin. Google Now users who select to “subscribe” to one of these sites are presented with cards that display the latest listings in their area. 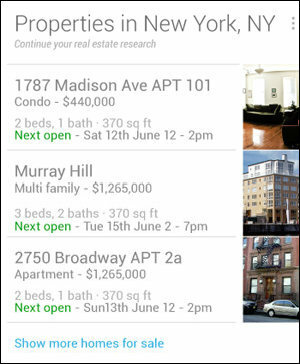 I think most people in CRE expected that Google would be able to aggregate real estate data themselves. So what’s interesting about these partnerships is that Google is relying on the partner’s resources to provide the data. This overcomes the problem of inconsistent data that the Atlantic Monthly writer pointed to and saves Google from trying to decipher myriad listing fields and formats. No commercial listing aggregator integrates with Google Now – yet – but to become a Google Now partner, you need to have an Android app. Only LoopNet has one at the moment (that I know of…) but its paywall might be problematic. The intention of Google Now is to provide useful information – not hawk “pay for” services. But Google has its fingers in other, tangentially CRE related, sites. Google Now partners with Auction.com (and Google is also a minority stakeholder). Auction.com’s Nowcast, updated monthly, uses Google’s search and other types of data to predict demand for home sales. And it’s turning out to be quite accurate. Google’s intention with Auction.com is to lend its technology expertise to foster greater transparency in the real estate sector. They specifically mention the hard to find investment sales data. I don’t know about you, but I don’t think the end game is just residential particularly with Auction.com’s recent push into the commercial market. Maybe there’s a Nowcast for investment properties in the near future? Google’s partnership approach is somewhat at odds with other tech giants’ plans for virtual assistants (VA). Microsoft’s Cortana, Facebook’s M and Apple’s upcoming update to Siri are all using artificial intelligence to determine questions and provide answers before you even know you have them. These VAs are eventually expected to “know” you’re looking for office space in some city and present you with information to help with your search. How that information is collected – by a general web search, culling from sites you normally visit and/or relying on “preferred” sources – and how that compares to using Google Now’s partner sources will be interesting to see. What does all this mean for CRE? Google could offer a path for brokerages or established listing aggregators to partner with Google Now to promote their listings. Or if these VA apps catch on, brokerages and agents need only maintain a mobile friendly website and local directory listings for VA apps to find what they’ve got to offer. Either way, CRE listing data will have more prospects for mobile exposure without someone else calling the shots.